What you wear matters. If you want to improve your homemaking, try this experiment and get fully dressed, every day, in something you love. Getting dressed really does change the way you go through your day! I think I’ve found the secret to being a better homemaker on a daily basis. (One of them, anyway). It’s this: Get dressed, every day, as early as you can, in something you love. I started doing this a few years ago, and now I can’t imagine it any other way. I remember hearing the career advice to “dress for the job you want, not the one you have.” Sometimes, of course, the job you have is the one you want, but either way, the point is to put your best self forward. Homemaking is my career. And it’s yours, too. Whatever other roles you play now or in the future (working outside the home, volunteering, running a business from your computer), you are also a homemaker. 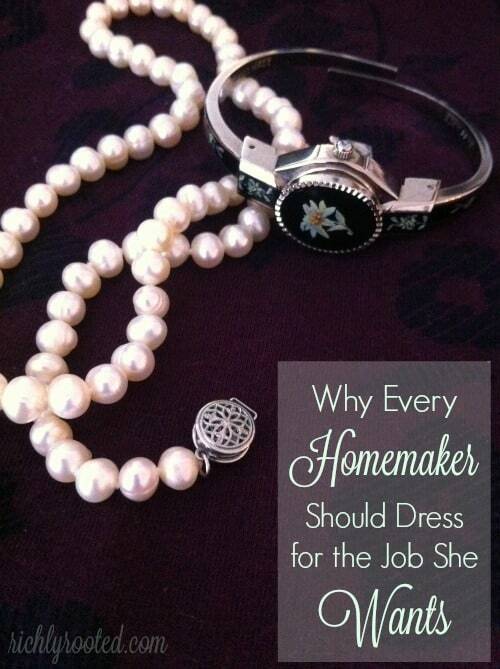 Does the way you dress reflect the kind of homemaker you want to be? If you want to be a homemaker who’s put together, even-keeled, confident in her work, and ready for whatever the day may bring, then dress like her. 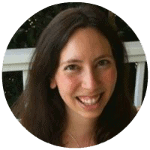 You might not feel like that expert homemaker, yet, but I promise you that dressing like one will help you grow into that role. Dressing up for the workplace shows your respect for others, for yourself, and for the work you do. The same holds true for the way you dress at home. Your family are the most important people in your life–getting dressed shows that you think they’re worth it! Just as it’s hard to slurp champagne, it’s hard to be a homemaking failure when you look amazing. Dressing up tells your subconscious mind that today is a special day (even if it’s only Monday), and you’ll begin to act accordingly. As I have learned from wise women more experienced than me, it’s not wrong to embrace self care as a mom or homemaker. In fact, it’s essential. (And now it’s one of the things I want my children to know me for.) When you respect yourself by taking time for your appearance, everything you do will reflect that thoughtfulness. Besides showing respect for your family and yourself, getting dressed shows that you value your work as a homemaker. And you should! I had to look up the reference to Sisyphus. I discovered that he was a king in Greek mythology who was cursed to roll a boulder up a hill for all eternity. Every time he got the boulder up the hill, it would roll back down and he would be forced to start all over. Yep, sometimes that’s exactly what homemaking feels like! Our work as homemakers never ends, and at times we resent being caught in that infinite loop of meal planning, bathroom cleaning, and diaper changing. Why bother getting dressed every day? Because your work as a homemaker, mundane as it seems, is worth it. “Dressed” does not equal sleepwear, or even workout clothes (unless you’re exercising). You can wear something more stylish without sacrificing comfort, though. In fact, I believe you should only wear clothes you’re comfortable in! Also try to include the extras–makeup, if you wear it, and jewelry that complements your outfit. It doesn’t have to be complicated (my makeup routine is pretty minimalist), but make these finishing touches part of your ritual. It doesn’t matter if you plan to leave the house that day or not. Make it second nature to look good. Getting dressed may very well be a keystone habit that changes the way you see yourself! Don’t let hours slip by before you take time out for your appearance. You want to spend as much of the day in that dressed, ready state as possible. Make getting dressed part of your morning routine. I often like to pick out my clothes the night before as part of my bedtime routine. It’s hard to do this if your wardrobe is full of junk. The process of decluttering your wardrobe will help you to identify what you love–or hate–about your clothes. Simplify down to just the styles, colors, and fabrics you enjoy, and you’ll find that getting dressed everyday is much easier (and something to look forward to)! My book, Your Simple Home Handbook, has chapters to help you simplify your clothes, shoes, and accessories so that you can begin to hone in on a wardrobe you love to wear. P.S. Want more habits of intentional homemakers? 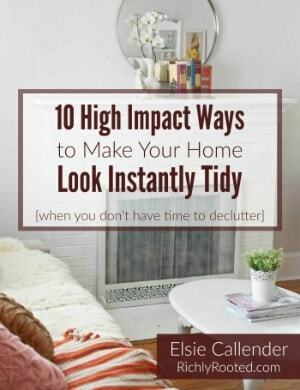 Read my post on 8 Things Intentional Homemakers Do Every Day. Love this! I plan on starting tomorrow! I normally wear sweatpants or pajamas all day when I know I will be at home and not going out. But I see how getting dressed would help me be more productive during the day for sure! Thank you for this post! You’re welcome! I hope it’s going well for you! I totally agree with your thoughts on Dressing. When I retired, I had all these lovely closes and jewelry. Now that I’m home, I still were them! I also agree with getting dressed as early as you can!!! Love it, Elsie! I started doing the same a while ago. For me, adding a necklace and matching my hair clip makes a difference, too. And of course I have to coordinate my apron to my outfit when I’m in the kitchen! I like feeling pretty at home. On days I had a test in school I would dress up, it caused me to concentrate better. This article is about to change my life. Thank you. I’ve had this thought before, because I homeschool and I wonder how serious can my boys take me when I’m still in the same clothes I rolled out of bed in. Also, I’ve gained some weight and when I put on my jeans I wonder, “how did this happen” do you know how? Because when all you wear uis pajama pants you don’t notice when you gain 5, 10, 15 pounds! Thanks again! I’ll be sharing this! This is something I try to do every day. Thank you for saying so well what is in my heart. Do you clean your house in your clothes? My problem…errr…excuse is that why get dressed up when you’re gonna ruin your clothes cleaning toilets, scrubbing showers. I need to get over this mindset! I do! It’s not as messy as I thought. One thing that helps is that I use really simple, natural cleaning agents. I don’t have to worry about splashing bleach or dusting spray on my clothes or anything like that since I just use basics like vinegar, baking soda, and microfiber cloths. I wear an apron if I think I’m going to get messy and when I’m baking with flour(: I also just do one or two cleaning chores per day, so I’m not working up a big sweat by toiling away! Thank you for writing this. Im going to put real clothes on right now! That’s awesome, Mia! Enjoy getting “dressed up”! I think you’ll love it! This very topic has been on my mind for so long! When I worked full time as a server, I couldn’t wait for my days off to get dressed in my nicest clothes, now as a homemaker, I have been searching for comfy but chic dresses, skirts, etc… to look nicer at home and more presentable for my hubby and children. There is something discouraging about always being in sweats/pj’s when you are doing your most favorite work! Thanks Elsie, going to implement this! I mean sometimes I think to myself, if I have to open the door today, I might be embarrassed, not a good feeling but totally preventable, lol! That’s sounds perfect! And I’m so glad you’ve been encouraged! What do you wear? I wore scrubs to work every day and athletic clothes all throughout school. So now, I tend to default to comfy pj clothes 1, because my sweet boy gets me up SO EARLY and 2. I don’t know what else to wear that is as comfy! Thank you! Personally, I love wearing skirts because they’re a little more cute/pretty, but still quite comfortable, especially if you get them with some elastic in the waistband. I linked to an L.L. Bean pocket skirt in one of the comments above! You get lots of mileage with skirts because you can mix up shirts and jewelry to go on top, or add soft leggings in the winter to extend its season. You can wear them with soft, fitted cotton tees with a neckline and colours you like. If you don’t like skirts, twill pants are usually nice and comfy, too. Jeans can be comfortable, too, of course…but ONLY if they’re the right fit, you know?